On Saturday, June 18, Russian President Vladimir Putin taught Syria’s President Bashar Assad a stinging lesson in humility that could have been lifted from the days of the Soviet empire, if not the Middle Ages. The exercise was designed to show the brutal Syrian ruler to the rest of the Middle East as no better than a puppet for Moscow to play with at will. The mission was entrusted to Russian Defense Minister Sergei Shoigu. 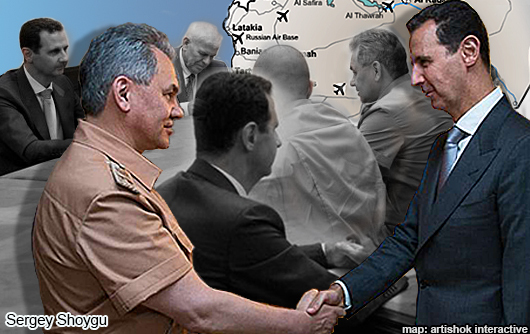 The Russian and Syrian media reported that the minister arrived in Damascus on Saturday, June 18, met with Assad, and then visited the Russian airbase near Latakia. However, DEBKA Weekly’s intelligence sources report that Shoigu never set foot in the capital. A junior officer from the Russian command at Khmeimim airbase called Assad’s office on Saturday morning and asked to speak with him on an urgent matter. The Syrian president, who does not normally take such calls, thought the Russians had important war news to convey and took the call. To his surprise, the Russian officer said he must come immediately to the Russian command in Latakia to meet an important figure who had arrived overnight from Moscow. The officer declined to provide any more information, stressing only that the trip must be kept secret, even from the president’s close aides. Assad decided there and then to forego the elaborate preparations required for any journey he makes outside his fortified palace in Damascus, and follow the Russian directive – even at the behest of a low-ranking Russian officer. He apparently construed the veil of secrecy as meaning that the important figure was none other than the Russian president in person. Our sources further report that when Assad’s plane landed at Khmeimim airbase, the Russian officers on hand insisted that the president’s entire party, including his bodyguards, remain on the plane, and that he only be attended by his personal Russian to Arabic interpreter. The Syrian leader was given no choice in this matter either. This sort of conduct recalled the manner in which Russian President Mikhail Gorbachev was removed from power in 1991. In those days top officials in Moscow often discovered they had been sacked when they were suddenly stripped of their bodyguards and close aides. A Russian military jeep drove Assad to the on-base apartment of the commander of Russian forces in Syria, Col. Gen. Alexander Dvornikov. There, he was stunned to find the Russian defense minister waiting for him, as he had no idea that Shoigu was even in the country. The only people present at the meeting were Assad, Shoigu and their interpreters. However, a Russian cameraman was on hand to record every moment of the encounter, with the focus on the Syrian president’s bewilderment and his twitchy movements when he was confronted by a smiling and confident Shoigu. The encounter lasted no more than ten minutes, but Moscow made a point of circulating embarrassing images of Assad’s discomfiture when Shoigu landed on his head a sharp message from Putin. It was a warning that any failure to instantly obey his orders from Moscow would have personal consequences. This was the first Russian threat to oust Assad if he failed to follow instructions. 1. To humiliate Assad in the eyes of the political and military hierarchy of his own regime by showing him up as a Russian puppet. 2. To circulate images depicting him as weak and failing in self-control in an unexpected crisis. He was also shown to the region’s governments from Tehran to Riyadh to have reached the end of the line with Moscow now ready to replace him. 3. To inform the US and the rest of the West and the Middle East that Syria is now a virtual Russian dominion and henceforth an instrument of Moscow’s policies.